When it comes to trick or treating, many people are tempted to bring their pets, but this is not always a good decision. If you do decide to bring your pet trick or treating with you, there are things you can do to be sure that they stay safe. Here are some tips that you should follow to keep your pets safe when you take them trick or treating. It might be tempting to purchase those cute and adorable costumes that they sell for your pet in the pet stores for Halloween, but no matter how tempting it is, you should think twice before you buy it. If your pet is not used to wearing any kind of clothing, you should never dress them up for Halloween; if you normally put your pet in clothes then you can go ahead and buy it. Otherwise it is a bad idea because if your pet is not used to clothes, making them wear a costume can make them uncomfortable, and it can even make them sick. Always remember that candy is not made for pets. Sure they might be begging for those treats that people are handing out, and they might look cute while they are asking for it, but do not give it to them. If your dog likes to beg for treats then you should consider keeping a bag of dog treats nearby and give your dog those instead of candy. 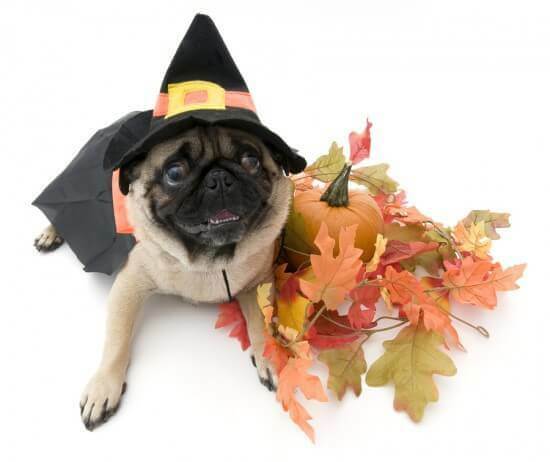 If you are going to be bringing your pet with you while you are trick or treating have them collared and leashed. Also, you need to make sure that they have their tags on their collar. This way if they do break away from the leash, or somehow get loose, they will be easily identified and that can increase the chances of having them returned to you. You might also consider microchipping your pet; these can’t be removed, and you can actually trace an animal’whereabouts with some of the more current microchips. If you do end up bringing your pet with you while trick-or-treating make sure that you keep them on the leash at all times. By keeping your pet right next to you, the risk is lower that some little kid is going to be giving them candy without you being aware of it. If you allow your pet to stay off leash they can approach anybody and be fed candy without you being aware of it. If you are going to dress up your pet for Halloween you need to make sure that they are the type who enjoys wearing costumes, otherwise dressing up your pet can cause them extreme stress. You are also going to want to make sure that the costume is safe for your pet. Some things to look for are non constricting costumes which allow your pet to move and breathe freely. And you want to watch out for small, dangling, or easily chewed off pieces on the costume that your pet could choke on. Just remember that before you decide to bring your pet trick or treating you should consider all aspects of your pet’personality. For example you don’t want to bring a pet that is aggressive or protective while you are trick or treating, nor do you want to bring a pet that is scared of strangers. Your best bet is to only bring the most social animals trick or treating with you. This will help to ensure that you both have a fun and safe Halloween.